West Dylan Thordson is a composer and bandleader who got his start in the Twin Cities music scene before moving to New York with a developing career as a composer of film scores. After leading the band A Whisper in the Noise for many years, he caught his first big break when M. Night Shyamalan featured his version of Bob Dylan's classic "The Times They Are A'Changin'" at the end of his film Lady in the Water. Though Thordson's move to New York was meant to be temporary, lasting only until the end of working on the film Foxcatcher, his rise in the ranks of film composers has continued this year: he scored every episode of the HBO hit series The Jinx: The Life and Deaths of Robert Durst. A consummate collaborator who has now worked with some of the biggest names in music, he has also developed a signature style and distinct way of recording instruments. This sets him apart, being able to dramatize ideas such as, in The Jinx, that "[t]he unveiling of evidence was very important to the function of music in the score." It's why he has had what can now be seen as a steady rise from bandleader to temp track composer for a film's initial cut into composer at large for any film where the director wants something a little unique. The last couple months I have been conversing with West via phone, e-mail, and in person to get to know one of this city's truly gifted creatives. In finding success he had to travel a similar road to that of Bob Dylan, but now Thordson finds himself writing music the way he writes it, a "somewhat rough and handmade sound...which is much more from the world of a slightly out-of-tune farmhouse piano." What first sparked your musical interests? My grandparents had an old Wurlitzer upright piano at their farmhouse. I remember figuring out how to play Mancini's Pink Panther theme on it. This is probably why I'm fond of chromatic patterns and the Hungarian scale. Music from video games like Final Fantasy and Ghosts 'n Goblins also had an impact on me. How did the Minnesota music scene shape your interests as a listener and composer? When I first started attempting live music, Radio K was a major influence. I love the winter in Minnesota and feel it brings a lot of inner depth and complexity to people. Most of the time this has a great effect on the music. There are so many talented, intelligent people within the culture. For better or worse, areas like Minneapolis/St. Paul are very much islands within themselves. Unfortunately, there's often a heavy filter between what people say outwardly and think internally. This is often dismissed as "Minnesota nice," but it seems far more complicated than that. There's a lot of unspoken darkness and guard to the population, unresolved from generations ago. While developing as a composer within this, I often found myself deeply insecure, paranoid, and second-guessing my work. Nonetheless, this was good for my development in many ways. It established a dissatisfaction in my efforts which has forced me to evolve quite a bit. As a result, I feel I attempted a much wider range of sound than I may have otherwise developed. What led you to developing A Whisper in the Noise? Initially, it stemmed from a collection of instrumentals I was attempting on a Fostex cassette four-track. Definitely was more into making a soundtrack for an imaginary film than music for a band. While growing up in rural, pre-Internet southern Minnesota, [starting] a band with vocals seemed to be the most viable solution to find any sort of audience for what I was creating. How did Whisper evolve to you being a film composer? It's a natural fit re-listening to those records, but curious how you found your voice in it. About ten years ago, a music supervisor named Sue Jacobs came across some of the band's music. When she discovered I had all the music catalogued in various instrumental versions, she grew very interested in trying it with films. We've become great friends over the years. Sue pretty much single-handedly opened the film world for me. In 2014 you also worked on Foxcatcher. How did that happen? Sue put together a music sampling of various composers for [director] Bennett Miller. She included some of my recordings, which Bennett really liked. Maybe a year later, I met with him in New York. At first, I was simply going to attempt creating the temp score. Mychael Danna was to complete the finished works. I actually relocated to New York City to work on this film. Fortunately, I became a lot more involved. How did you fit with the aesthetic designed with the other composers? There is a similar intimacy to the melodic voices all three of us gravitate towards. While Mychael and Rob Simonsen tend to evoke a more sophisticated quality, it seemed Bennett really liked the idea of incorporating my somewhat rough and handmade sound...which is much more from the world of a slightly out-of-tune farmhouse piano. Was your version of "Times They Are A'Changin'" always part of the equation? It did end up in a cut, early on, though it was removed for a short while. Over the course of editing, so much was tried out and removed. This was one of few pieces introduced in the initial assembly that made it to the final release. Why did you develop the version, as originally released, with vocals and choir? Worded vocals are often distracting with film. Without vocals, music tends to inhabit the moment rather than narrate it. How and when were you brought on The Jinx? Rob Simonsen worked with director Andrew Jarecki on All Good Things. Did he help at alln or was this a completely separate situation? I started on it in late May of 2014, right before they discovered the "killed them all..." bathroom recording. 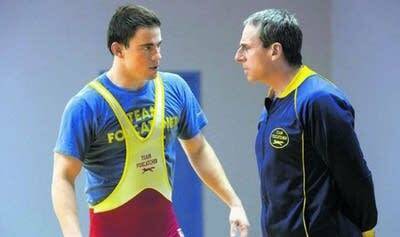 Working on Foxcatcher was definitely what got me in the door to audition material for The Jinx. Though Rob Simonsen composed for All Good Things, he wasn't involved with the series. Were there clear directives for the sound from the beginning or was it more up to you for shape and define? Early on I wrote for a very wide range. Sue Jacobs is a big advocate for writing loosely...in broad strokes. The filmmakers were definitely searching for the right music when I came aboard. It quickly seemed the series needed a focus on a dark, comedic tone with moments of sincere sadness and hope. Percussive drive was also necessary. The whole story is so absurd. There was definitely an interest in a ridiculous, tabloid, New York Daily News feel. Generally the film composer's task is to create musical options rather than opinions, especially early on. You definitely don't want to be a yes man, yet it's vital to operate with humility. More often than not it's strange how little control the composer actually has over the score. Unless you're making the film completely by yourself, it's critical that you are working within a circle of people you trust artistically; it's vital to remain open and honest for the art form to function well. Sometimes your only option, if you're truly unhappy with the score's direction, is to quit the production. John Kusiak was also brought on for a couple episodes. Did you work with him or, how did his involvement effect your own work—if at all? John came on for a couple months in the autumn of 2014. He's a wonderful person, and I learned a lot from him. When HBO picked up the series, the schedule became extremely tight, and two composers seemed necessary for the volume of work. John and I mainly worked together on the first two episodes. The tone of his material with Errol Morris, especially his music for Tabloid, was important to the language of the score. We also co-wrote some themes together. Did you work as if the series was a six-hour movie or six one-hour movies? How did that impact your thinking of the musical considerations? The second-to-last episode has an incredible driving force behind the unveiling of evidence. It was definitely approached, more so, as a single movie, yet with a sense of chapters. As the series developed, many segments were shifted between episodes to balance the work as a whole. A sense of pause is tremendously important in a story this complex, so an episodic approach is perfect for something like this. This is partially why I feel The Jinx functions better than All Good Things. The unveiling of evidence was very important to the function of music in the score. With all the information in play, repetition was critical. We continually discussed the effect of 'peeling away' to deliver the story. Working with multiple episodes in mind definitely helped keep perspective. Was everything composed to picture? I was working on almost all the cues well before the picture was locked, so I needed to keep things very loose and open. Though most of the music needed to be rewritten to locked picture, I continually found it more effective to start compositions by only lightly watching segments and working completely free of picture... simply keeping the impressions in mind. The music editor Suzana Peric frequently reminds me of this priceless advice. Often time, music written directly to picture sounds mechanical and heavy-handed. There is a lot of great magic that happens from a light-handed, natural approach. Greater complexity in the story often comes through. Over the course of the series how did you decide when to evolve something already used—versus when a new ideas were needed? We often held discussions about this. Many times, a theme was assigned to a specific person, action, or relationship. Yet if it felt too on-the-nose, a thematic approach would be thrown out completely. Due to the evolution of the story, new motifs continually seemed necessary. How did you decide on the balance of organic instrumentation and electronic interface? It seems as though a very large part of Bob Durst is purely mechanical, so electronic pulse and texture felt more than fitting. There was definitely an influence from Brad Fiedel's Terminator theme. I really didn't want that stylized '80s sound, though. With everything electronic, I felt it was important to put a human touch to it, so almost all of the pulses were loosely hand-played and not quantized. Whether people feel comfortable admitting it, a large part of all of us is purely mechanical. The story of The Jinx was told in a way that it's hard to not see Bob as a human being. I think it's important to be aware that we're all capable of horrible behavior. Your music has a certain organic sound I feel can be tracked all the way to your beginnings, but it also feels always on the verge of collapse, which fits beautifully with this narrative as it unfolds. Was that at all the idea, or did instruments like the saw and piano come in for other reasons completely? I think that sound evolved out of playing with new ideas loosely and recording them without a click track. This approach seemed to work well for The Jinx early on, so I kept it up. Much of the music was recorded while it was still being written. Without a perfectly defined expectation for a finished idea, the early recordings would naturally collapse at some point. In some cases a tight, concise—intentionally hokey—ending was created and the pieces were re-recorded. Other times, the early recording was best, due to this loose, off-the-cuff feel. Did you play everything on the record, or did you bring in trusted players to support your ideas? If so, how does that work for you? There was a blend of this. The ensemble So Percussion worked with me on a lot of the percussion recordings. The saw melodies were written specifically for Natalia Paruz to perform. Additionally, I recorded some string players and a horn player. Most of the time, there will be a skeletal structure of a recording started when I bring players in. I like to approach ideas as written, at first, and then go wide with some following takes. Often I'll attempt isolating the newly recorded parts to start completely unrelated ideas from scratch. How do you generally sit down to compose something and how do you know when something is missing? How do you know when to pull back into more atmospherics and when to really drive the narrative? It seems all compositions develop for me out of a lot of trial and error. In order to start a composition I simply sit down and start playing around. Something sounds cool, and I spend time destroying and rebuilding it. Sometimes I attempt to loosely replay a melody, texture, or rhythm I have in mind, only to go with whatever broken version starts coming out. I've got very imperfect pitch. Once things feel in a malleable place, I'll usually attempt shaping the work toward something that somehow aids the story. I like to look for relationships between sound and picture that pronounce subtleties rather than enhance the obvious. I despise art that assumes the audience is stupid. Did you know the end of The Jinx ahead of time? Did it feed your production and evolution? I did. This definitely impacted how the effect of "peeling away" the story would be supported by the music. Without this knowledge, I think it would have been easy to get trapped in going too large, too fast.